After receiving many wonderful emails asking me how to create the perfect red lips for Vintage & Pinup looks, I’ve decided to create a blog with some of my tips and tricks that I’ve learnt as a Makeup Artist & Pinup Model. There is no right or wrong way to apply your lipstick, have a go & adapt techniques to suit you and your preferred look. Towards the bottom of this page I have supplied a list of products that I use to create my Ruby Red Lips. However these are always changing as I discover new products. So once again experiment with what works for you! A smooth surface is best to apply your red lippy (or any lipstick colour for that matter). This will make your finished look far more polished and will allow your lippy to stay put longer without flaking. After a shower when your lips are soft from the warm water, take a new dry tooth brush & gently rub it across the surface of your lips. This process removes any flaking skin and helps to brighten the surface of your lips. Apply your favorite lip balm once complete. Two to three times a week use a sugar scrub on your lips to remove any dryness & dull areas. Rub the scrub across your lips gently then rinse off with warm water. Apply your favorite lip balm to seal in the moisture. NOTE: Both methods are best done at night time before going to sleep. After all what is another 5mins added to your vintage nightly beauty routine. Your lips will be smooth & glowing within no time! Your lip liner is just as important as you lipstick. It helps to create the perfect lip line and prevent that beautiful lippy bleeding! Red Lipstick does have a tendency to bleed or run more than other colours, however this is nothing that a little preparation can’t fix….so don’t let it put you off! 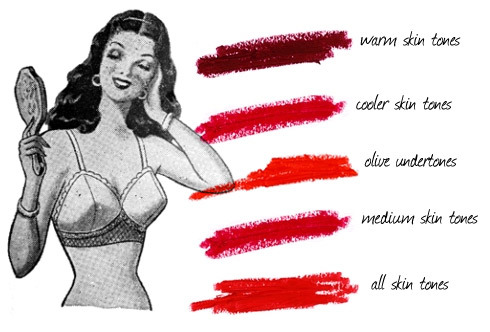 Choose a red lip liner that is as close to the shade of your choosen red lippy as possible. Doing this will prevent any nasty miss matched outline when your lippy wears off during eating, drinking or those lovely chats with the ladies! Apply a lip base or primer to your lips. Try to avoid using any greasy or high shine lip balms as this can cause your red lippy to bleed. Bottom Lip: With a sharpened red lip liner gently out line your bottom lip, being careful not to go too far outside of your natural lip line. Top Lip: Place the sharpened point of the pencil at the highest point of your cupids bow, draw a line diagonally downwards until you reach the bottom of your top lip. Repeat on the other side until you have a small cross in the centre of your top lip. This will create a perfect point for those vintage lips! Outline your top lip, ensuring the lines are even. Carefully colour in your top and bottom lip with your lip liner. This will help your lippy hold onto your lips longer but will also provide a more intense colour. 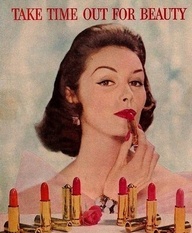 There are two basic types of lipstick finishes for vintage looks. Matte & Gloss. Choose which ever works best for you & the look that you are going for. Experimentation is your best friend! I tend to use more Matte Reds for photo shoots and classic pinup looks & use the Gloss Reds for more seductive Burlesque looks. Gently coat a lip brush with your lipstick of choice, completely fill in your lips covering all areas outlined. Using a lip brush with such intense colours ensures a more precise and controlled finish, no going outside of those beautiful lip lines! Intensify your lip colour by using the lip stick directly on your lips. Do this by dabbing the lippy gently in the middle of your top & bottom lip to create a pout effect. If your lipstick is more of a matte finish you can apply a clear lip gloss over the top to create a wet look. Fold a tissue in half and gently place between your lips to blot off any excuess lipstick. Dab a small amount of liquid highlighter between the two points of your cupids bow, this will create more depth to your lips. NOTE: If any lipstick or liner has been smudged outside of you lip area, carefully take a small amount of concealer on an sponge eye shadow applicator & dab away the red. Apply a small amount of foundation & powder over the top of the correction. Remember keep you lipstick in your handbag for any little touch ups. Practice really does make perfect when applying Red Lipstick. There are many methods of application out there, so mix & match until you find something that works for you! I truly hope this helped answer some of the red lipstick questions. Please feel free to ask me any questions. If you have any tips or products I should try let me know!